Background: Protein is a macromolecule, consisting of one or more long chains of amino residues. And it plays a vital role in the life system, especially for the evaluation of many diseases. Thus, the quantitative measurement of protein is benefit for the diagnosis and monitoring of diseases. Among the sensing methods currently developed, fluorescence detection is of particular concern as a technique with the potential to provide accurate and quantitative analyses. A wide variety of molecular probes for protein detection have been designed and synthesized for sensing, imaging, and biomedical applications. 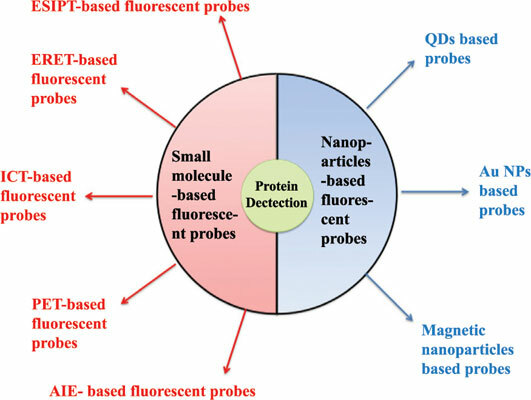 Conclusion: In this report, we provide an overview of the varied probes from small molecular to nanoparticle-based sensors which have been applied to detect a various proteins from bench to bed. Furthermore, some emerging trends, future directions as well as challenges in this rapidly growing field are discussed. Fluorescent probe, detection, molecular imaging, biosensor, optical imaging, molecular probes.